Most of the electricity demand in Mainland China is fulfilled from fossil fuels, predominantly from coal which is about 70% of total power generation in China. Renewable energy sources such as Wind energy have capacity of 8.6% of total, but delivering only 3.3% of the total electricity. Rapid demand of electricity in China has been rising significantly and the reliance on fossil fuels has led to the much Air and water pollution which led the government to aggressively adopt and deploy nuclear energy. The demand for nuclear reactor coolant pumps is expected to increase in the future due to the number of nuclear plants being built in the Asia Pacific region, specifically China. China is moving forward rapidly in building new nuclear power plants, many of them conspicuously on time and on budget and proposed projects will further impel the growth of coolant pumps in future. Goldstein Research analyst forecast the China nuclear reactor coolant pumps market to expand at a CAGR of 17.6% during the forecast period 2016-2024. The demand for coolant pumps in nuclear power plants and reactors in China is expected to reach USD 1.4 billion by 2024 owing to aggressive deployment of nuclear power plants in China. The report covers the present ground scenario and the future growth prospects of the nuclear reactor coolant pumps market for 2016-2024 along with the total revenue of nuclear reactor coolant pumps industry in China. We calculated the market size and revenue share on the basis of revenue generated per segment at regional level. The revenue forecast is given on the basis of number of nuclear reactor coolant pumps manufacturers and current growth rate of the market. Based on Applications, electricity generation accounted for the highest market share in China nuclear reactor coolant pumps market in 2016. Moreover, electricity production is likely to dominate the market over the forecast period owing to major demand for replacement in existing nuclear reactors and installation of new products in under construction projects. China Nuclear Reactor Coolant Pumps Market Outlook 2016-2024, has been prepared based on an in-depth market analysis from industry experts. 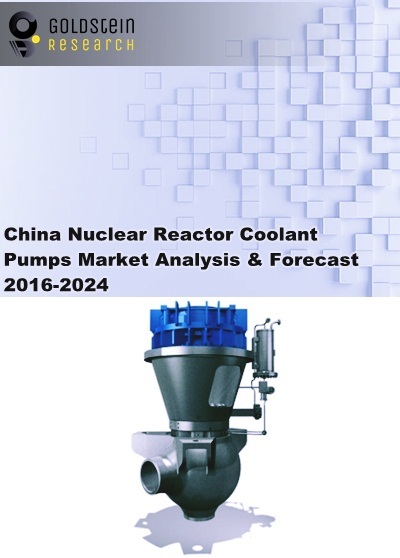 The report covers the competitive landscape and current position of major players in the China nuclear reactor coolant pumps market. The report also includes porter’s five force model, SWOT analysis, company profiling, business strategies of market players and their business models. China nuclear reactor coolant pumps market report also recognizes value chain analysis to understand the cost differentiation to provide competitive advantage to the existing and new entry players. Our China nuclear reactor coolant pumps market report comprises of the following companies as the key players in the China nuclear reactor coolant pumps market: Areva, SPX Corporation, KSB Pumps, Weir Group PLC, CNNC (China National Nuclear Corporation), Rosatom, Westinghouse Electric Company, CGN, Hitachi GE Nuclear Energy, Mitsubishi Heavy Industries, Andritz AG, Dongfang Electric Corporation, Ebara Corporation, Flowserve Corporation, Curtiss-Wright Corporation, Shanghai Electric Group Company Limited and Sulzer AG. According to our China nuclear reactor coolant pumps market study on the basis of extensive primary and secondary research, one major driver in the market is growing demand for electricity across China and to curb its reliance on coal, which pollutes the air. China has 38 nuclear power reactors in operation and 19 under construction. China has increased its number of operating reactors by more than ten times since 2000 and plans to bring five units into commercial operation until 2018 which is likely to propel the growth of nuclear reactor coolant pumps market in China. According to the report, major trend in China nuclear reactor coolant pumps market is technological advancement of melt-down proof nuclear power plants. For instance, AP1000, designed and made by Toshiba Corp’s Westinghouse Electric subsidiary, is designed to be melt-proof to avoid any kind of severe accident. Compared with current nuclear reactor technology, the AP1000 reactor technology is theoretically 100 times safer, requires 80 per cent less piping and 85 per cent fewer control cables. Further, the report states that one challenge in China nuclear reactor coolant pumps market is generation of nuclear waste and probability of tragic accidents at nuclear power plants. Public acceptance and complex infrastructure of the nuclear reactors are the major challenges for the significant growth of nuclear power reactors which eventually impacts the growth of coolant pumps market.